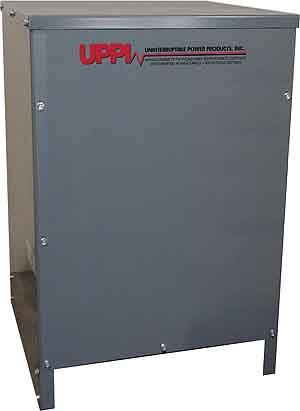 Source: Uninterruptible Power Products, Inc. The PowerRide RTD is a ferroresonant-based batteryless ride through device designed to maintain continuous single-phase regulated output voltage from a three-phase input. The unit, which is ideally suited for the industrial manufacturing environment, provides clean, regulated power for control circuits and process control machinery. In addition to providing protection from loss of any one phase (wye connected) or two phases (delta connected), the PowerRide RTD also provides protection from spikes, surges, brownouts, and transient noise. It is presently available in the .5kva through 10kva size range, with multiple input/output voltages, and enclosure choices. Uninterruptible Power Products, Inc., 1567 W. 11th Drive, Friendship, WI 53934. Tel: 608-339-2151; Fax: 608-339-4494.